Ever since my first listen to The National's 2005 masterpiece Alligator the band has resonated with me in every aspect of my life. The youthful confusion and feelings of fulfilled unfulfillment that flow through the lyrics, the sorrow and matter-of-fact battles between realities and dream states that drive these conversational pieces of music make it feel ultimately timeless. Matt Berninger's vocals, so velvety, dark, and drenched in whiskey and rain carry all of the lyrical sentiments perfectly. And Alligator was an excellent showcase of the band, what they wanted, what they could be, and how we were to understand them. That album was like a Rosetta Stone. And it was incredible, through and through. Songs like "Secret Meeting," "Lit Up" and "City Middle" drove an album about unrest, hope, failure and finally closed with a song of redemption (and disappointment) with "Mr. November." Then, Boxer came out in 2007, and brought sparser weight and darkness, lacking the the hard rocking anthems of its predecessor. I liked (and like) quiet a bit, but I don't love it, not like I do Boxer not like I do Alligator, but perhaps that's as much a result of the love-at-first-listen issue as with the dour nature of the album. Regardless, knowing that 2010 meant a highly touted new album from The National was coming held me in stitches, as if this were a sort of New Christmas. And what I can tell you, after picking up my copy and listening, is that a lot has changed since Boxer, but with High Violet a lot remains the same. More dynamic, lush and dramatic than Boxer, finding a spot that shows maturity beyond Alligator, but still tied securely to the early work, High Violet is an album with full sound, looping echoes and distant cries (and occasionally, drums that sound like distant helicopter rotors). The National are unmistakable in their style, one where even when the pace increases, the sense of urgency is built more greatly into the lyrics than into the music. Things burn slowly on High Violet like the works that came before it, but this time it feels like the fuel for that fire has changed from a campfire (Alligator) or a slowly dying cigarette (Boxer) to a sort of quiet forest fire. Don't mistake my strange metaphor. This new album isn't louder or more domineering, but the world it embodies is larger, and just as wrought with doubt and passion as those worlds before. "Bloodbuzz Ohio" is a prime example of the vastness of the album, where lyrics like "I was carried to Ohio in a swarm of bees" are at the forefront of an aptly buzzing guitar and drums that build and build while never attempting dominance. Everything is forceful, but restrained, reluctant. The song also features the late-twenties loan-driven life lines, "I still owe money to the money to the money I owe/I never thought about love/When I thought about home." This is what The National are about, that disconnect of life and expectation, of what we think should be broad strokes of success and are often just small battles to keep our heads above water, in lifestyle and in emotion. 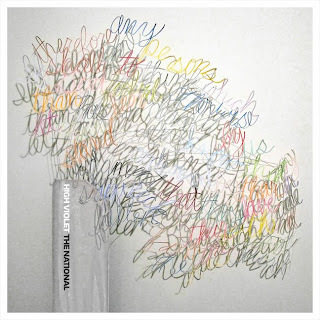 Granted, The National can also come off as pretentious and lacking lyrical direction. Their words are rarely stories in themselves, with beginnings, climaxes, and denouement. Instead, the songs are written as pieces of stories, snapshots of thoughts and moods. Short of calling it stream of consciousness in some vague Woolf comparison, I'll say this: Life is all snapshots. When we look back we don't see the whole story, we never remember the middling days, the moments where mania was tamed and desperation appeased. We remember the moments that make us want, ever so briefly, to die, to escape, and to alter our courses completely like drifting ships at sea. We remember the passionate moments where two bodies connect, or the rage or fizzle of two bodies parting ways. And because memory, because life, works this way, as a poorly assembled scrapbook of moods pasted to tear- and sun-soaked paper The National works. High Violet doesn't feel like Alligator, but for me, I don't think any other album could. And it doesn't need to be anything but what it is: a self-aware album of lush, beautiful songs applied in brushstrokes to a wasteland canvas.